The materials with which a building's facade is constructed are a key element not only to its beauty but also to its practicality. Good facade design allows the building to look beautiful from the outside and inside and to save the owner money when it comes to heating and cooling. The following discusses the components and concerns of energy-efficient facade design. 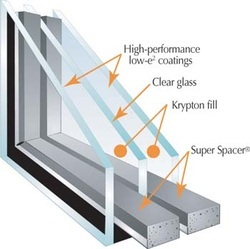 A building's facade system should have a high thermal performance. This means that because the facade system helps the building gain less heat, the air conditioning system is subject to a lower load. Since the air conditioning system accounts for a significant portion of a typical building's electricity bill, having a facade system that facilitates good thermal performance has a direct impact on energy consumption. In order to design buildings that will provide comfort with less energy use, you must understand the properties of the facade's materials. Different building materials have different thermal conductivities and specific heat capacities. These differences influence their thermal performance. On the flip side, reliable and accurate information on the "coolness" of construction materials is often lacking.